American University will partner with The John F. Kennedy Center for the Performing Arts on a fellowship program for 2016-2017 offering graduate students increased professional development opportunities in an effort to diversify leadership in the arts management field. Reflecting the Kennedy Center’s focus on increasing diversity and including in the arts, candidates for the program will represent student diversity, and have existing experience in their fields. The fellowship consists of shadowing executive positions and pursuit of professional projects for 20 hours a week during the academic year to gain exposure and high-level mentorship at a world-class arts institution. Additionally, fellows will receive a $15,000 stipend and six credits of tuition remission, making the program accessible to the next generation of arts managers. The fellowship will be for one academic year, with the option to renew for an additional year, and is geared toward helping graduate students add to their professional portfolio, in addition to their education. This program will complement the existing collegiate internship program focused on undergraduate students as the Kennedy Center expands its educational and professional development offerings. Fellows will receive intensive training in arts management, strategic planning, fundraising, finance, artistic planning, and marketing. They will have exposure to executive leadership and have the opportunity to get involved in special projects of personal interest and of benefit to the Kennedy Center. They will participate in collaborative work opportunities across the organization, and receive ongoing personalized mentoring from a senior level staff advisor. AU academic advisors will support the fellows as they pursue their organizational and professional objectives. 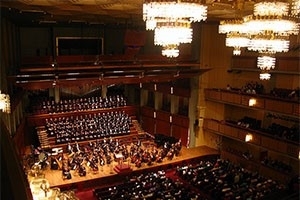 For more information, or to apply visit: http://www.american.edu/cas/arts-management/kennedy-center-fellowship.cfm.